Ordinarily, games don’t come with a lot of history, but you can’t fully appreciate Babylonian Twins without first knowing something of the back story. You see, the game was was initially created for the Amiga and was the first ever Iraqi-developed video game, made shortly after the First Gulf War. Despite the appearance of a well-received demo version, the full game was never made available, so it’s taken roughly 16 years for Babylonian Twins to finally emerge into the spotlight, and what a triumphant entrance it is. 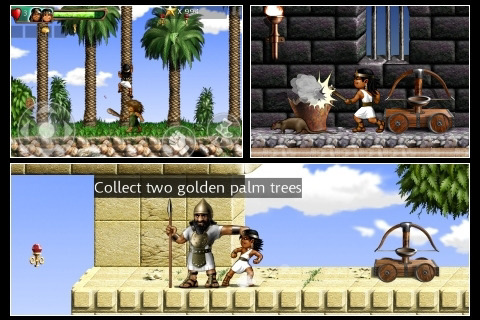 A 2-D puzzle-platformer, the game follows the adventures of twin Babylonian princes, Blasir and Nasir. They have been cursed and imprisoned by an evil sorcerer, and they must defeat him and save their beloved city. The story is a little thin, but the action is plentiful. You control both Blasir and Nasir, and they each have their own unique abilities. Blasir is able to jump higher than his brother and has a special Dash attack that allows him to speed across short mid-air distances. Conversely, Nasir can drill through weak sections of floor and has a mace capable of smashing certain items. You only control one twin at a time, with the other temporarily turning to stone. The stone twin is frequently a key puzzle element, as he can be used to hold down buttons or used to jump to higher places. You can switch back and forth between the two on the fly, and this will be necessary to complete the levels. Levels are completed when you manage to collect all of the golden palms hidden throughout. One of the things I really liked about the game is that there isn’t a lot of hand holding. You have a few hints here and there, but for the most part, you’re on your own. The levels are huge, so there’s tons of exploration involved, as well as plenty of hidden areas and items. Sometimes it can be difficult to figure out what to do next, since the difference between a regular wall and one you can break through is usually slight, so there is a certain amount of vigilance required. Avoiding enemies and solving puzzles proves to be no cakewalk, but each level is quite rich and satisfying in its expansive complexity. I will always long for physical buttons, especially for retro-style games like Babylonian Twins, but the controls were fluid and responsive enough to keep me satisfied, The levels also look and sound great with historically sourced design elements and traditional music. While Babylonian Twins retains a fun, old-school feeling, the updated graphics and sound go a long way to making this game seem like a true hybrid of past and present game design. Even if you care nothing at all about its unique development history, Babylonian Twins is still a great game. It is rather difficult and requires a certain amount of dedication and focus, but it is a very robust and satisfying challenge that offers hours and hours of brilliant and gorgeous gameplay, all wrapped up with a generous dollop of history and culture. AppSafari review of Babylonian Twins was written by Tracy Yonemoto on May 11th, 2010 and categorized under Action, Adventure, App Store, Fun, Games, Platformer, Puzzler. Page viewed 3453 times, 1 so far today. Need help on using these apps? Please read the Help Page.